Trains set the American spirit in motion. Forged in iron and steel, these massive workhorses propel the innate desire for freedom and exploration, gliding our aspirations along rails stretching to every point across our nation. They afforded our ancestors paths to taming a new land. They sometimes transported loved ones away but easily brought them back home to warm, welcoming embraces. They expanded our horizons, bridging the gaps between places, people, and dreams. One does not have to explain their magic to a child. It is visceral and natural to the spirit. Watch as a young one, barely able to speak, spies a locomotive. Eyes widen with excitement, the heart beating faster as the child stretches and strives for a better view. Their elation gives way to one of their first words, usually stated as a singular exclamation: train! Such a scene is common along South Water Street in Paducah. There sits Paducah's icon of the railroad industry: steam locomotive 1518 and its accompanying cars. A focal point of our downtown district, 1518 attracts a nearly constant flow of foot traffic, igniting the imaginations of young and old alike. "A lot of people think it was built in Paducah," says Bob Johnston, Paducah railroad historian, "but it wasn't. It was built in Lima, Ohio. It was rebuilt in Paducah twice, however. Once in 1940 and again in 1951. The Illinois Central Railroad used 1518 mostly to to haul coal between Central City and Paducah. They used the steam locomotives for a long time because the coal companies were not fans of diesel engines." 1518 is in a class of locomotives known as Mikado. The name is derived from a Gilbert & Sullivan opera that is set in Japan. The Imperial Japenese Railways ordered a group of the locomotives in 1893, just eight years after the opera's debut. By 1950, over one-third of the ICRR's locomotives were of the same configuration, and 1518 was still on the company's roster until 1960. As diesel engines eventually took over, however, the Mikados were retired and scrapped. By the end of 1960, only one Mikado remained. It was at this time that ICRR President Wayne Johnston received a letter from Dr. J. Freeland Hicks (Doc Hicks) requesting a locomotive for display in Paducah. 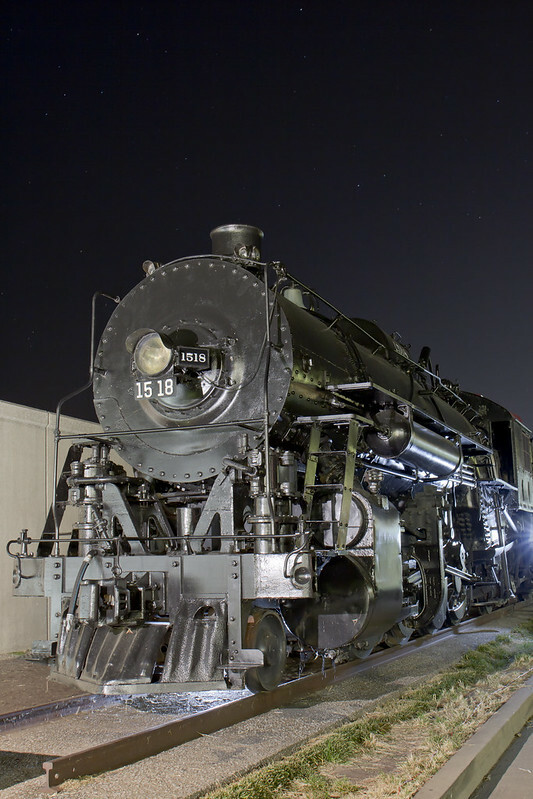 The letter sparked an over-three-year dialog between ICRR and city officials, solving transfer problems and crafting a plan to place the last Mikado steam locomotive in Paducah. In April, 1964, locomotive 1518 found its new home as it went on display downtown. Maintenance of the locomotive and its accompanying cars has always been an issue. The train is exposed to the elements, creating an ongoing need for paint restoration. Earlier this year, the need for a new paint job was more than evident. "What put me on this was my son," says City Commissioner Allan Rhodes. "He was working with the Coalition for Sustainable Rail and had worked on a locomotive donated from the city of Topeka. I told him about the bids that had come in for painting our train. We were getting figures around $100,000. He said, 'You've got to be kidding! We spent just a few thousand here in Topeka.' I talked to the mayor, and she said, 'Ok. Just figure out a way forward!'" The major reduction in cost came from rolling and brushing the paint on as opposed to spraying. Some were skeptical that it would work. "On a fifty-two degree, overcast day, I painted four square yards on the tinder," says Allan. "I then brought out the mayor, city manager, and the commissioners and said, 'Here's what I did with a roller.'" Allan secured the help of volunteers from the halfway house; 91 gallons of direct-to-metal paint donated by Sherwin Williams; support work from Triangle Enterprises, M&M Decorating, National Railway Equipment (formerly VMV); and brothers Oreese and Donald Ivery. Oreese supervised as his career had been painting at VMV. For nearly three weeks, the crew painted, rolling and brushing new life onto the exterior. By the end, the train radiated a glow from locomotive to caboose. The approach also saved the city thousands of dollars. "All you need is somebody crazy enough to do it," laughs Allan. Through the innovative and willing spirit of Allan and crew, Paducah's 1518 locomotive and cars will now enjoy more years of life. In less than eight years, it will celebrate its hundredth birthday. The train is not only a testament to the importance of the railroad industry in our city, it has become a vital anchor within the countenance of downtown. Could we imagine Paducah without our train and the aura of magic it creates? Bob Johnston simply sums it up: "Everybody likes trains!"